We drove alongside Loch Ness (the largest volume of water but not largest in area) this morning and stopped for a photo opportunity but couldn't see much (raining again). 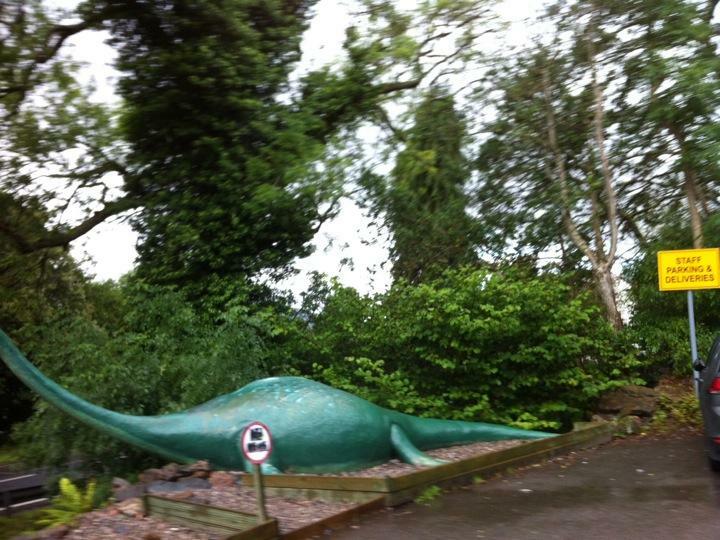 No sign of Nessie, I looked in vain! Passed through Inverness, the capital of the Highlands, and crossed the River Ness before heading to the Cairngorms National Park. We drove Speyside (along the River Spey) where there are many whiskey distilleries and stopped at Ballindallich Castle for a lovely lunch and tour of the castle. The lady of the castle is the Queen's representative and there were many photos of them with the royal family and them at William and Kate's wedding, etc. Continued on to Aviemore which is in the middle of the Cairngorms and a very busy place as there is a large lake as well as the mountains and the steam railway. Lots of ski runs around here! Our hotel would have been lovely in its day but badly needed refurbishing. Water was leaking from the ceiling, carpet was torn, and to make matters worse the fire alarm went off at 11 pm (very loudly and for a very long time) so people were evacuating before they told us it was a false alarm caused by steam from the shower. What the?? ?